Absolutely scrumptious! Actually, I take that back. Scrumptious does not even begin to express how amazing this short holiday novella was. I devoured Elise and Jay's story, Once Upon a Bride, and was more than a little excited to find out that they would be getting another novella. I'm so so happy that Jenny Holiday decided to write these two characters' stories because they are my favorite from the series. In Once Upon a Bride, we find out that Elise is infertile and that Jay wants nothing to do with children because he is afraid of taking after his own father. Their lives are thrown upside down here when Elise finds out that she is, in fact, pregnant, and even though she had grown to the idea of not becoming a mother, she is determined to this baby to the world. 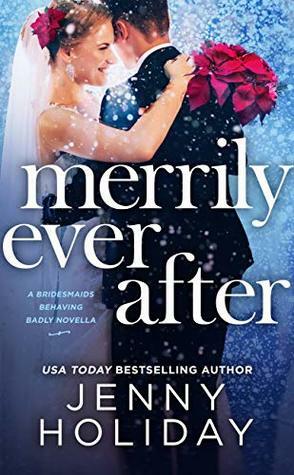 Merrily Ever After was quite angsty for a holiday novella, but I loved it just the way it was. I was curious to see how Elise and Jay would work through this upheaval in their lives. It's not often that you get to peek into the lives of a fictional couple after their happily ever after, so I appreciate it whenever I can find books that do just that. Jay and Elise's relationship definitely went through a bumpy road in Merrily Ever After, but Jenny Holiday never ever made me feel like I could not believe in the strength of their relationship. In fact, she explored the depth of their relationship even further here and it was all very majestic. I just ship these two so so hard and they made my heart ache and cry in happiness. Jay and Elise were both bullheaded characters who clicked entirely too well together. I'll admit to wanting to shake Jay by the shoulders a couple of times, but boy did he redeem himself. The groveling/seeking forgiveness scene towards the end made me bawl like a baby and I'm not usually a crier when it comes to books. It was so beautiful and romantic and gahhh! ALL THE FREAKING SWOONS! Don't get me started on the friendship here either. It's always been a fantastic part of the Bridesmaids Behaving Badly series, but I never tire of seeing these girls bond and support each other like nobody's business. Great romance, great friendships, what more can you ask for? Just pick up the book already if you haven't had the chance to yet! If you would like to read a well-written and absolutely swoony contemporary romance series, I can't recommend this series enough. You have got to meet these delightful characters, ASAP! Do you enjoy novellas? Have you read the Bridesmaids Behaving Badly series?